We at Church Motor Company use a variety of computer diagnostic tools from leading manufacturers including Snap-On, Bosch, VAG-Com, Launch and Auto-Com. Each machine has different capabilities and to be totally honest no one machine is better than the other, they all have their strengths and weaknesses. As like main dealer equipment these machines are very expensive but are a ‘must-have’ to any serious repairer looking to get the job done and we feel we have the best available to our market. Diagnostic computers alone will not fix cars and its amusing to us that some people can assume that one of these computers can be plugged in, and ‘hey presto’, we get the answer to the problem. In most occasions the computers will give us detailed information needed to cure the problem and yes sometimes will even display the exact part which is causing the engine light to display or engine to run in an unmanageable way. Most of our equipment is able to ‘code’ and transfer data from old units to new just like the dealer equivalent. 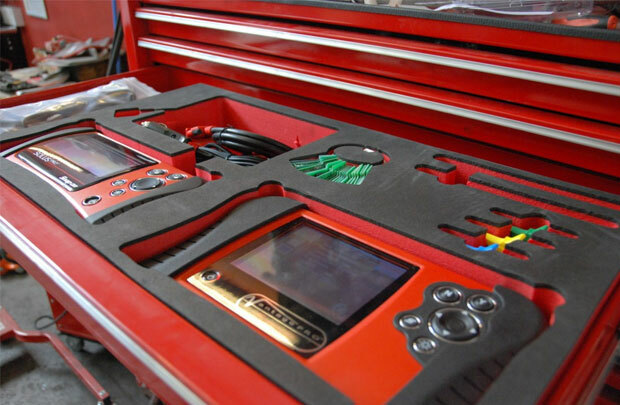 In some cases where we are unable to carry out this work we will look to our close circle of friends and acquaintances in the trade where we have use of the in-house, main dealer, diagnostic systems. We will always advise you of this as your repair commences. We try and keep our diagnostic charges as fair as possible but as you can appreciate this can sometimes sway both ways depending on the severity of the problem. We charge a minimal amount of £45.00 inclusive of VAT which covers you for the initial use of the diagnostic computer and operator. Hopefully, and in most cases, we are able to prescribe the part required to remedy your fault during this procedure. Unfortunately, if we require further time on the vehicle we will always talk to you first outlining our thoughts on the depth of the problem and what will be required to achieve the finished result.